The Cascate del Mulino di Saturnia is a hidden gem located in the Maremma area of southern Tuscany. 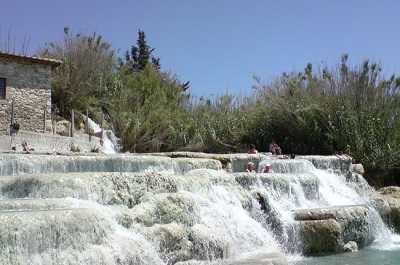 The Cascatelle (how the locals refer to the area) is a thermal spring with cascading waterfalls and natural pools. The waterfalls are open 24 hours a day, 365 days of the year and the best part is admission is free. What makes this so special is that the water temperature is in the mid to high 90°F and it is believed to have special healing powers. The water is enriched with sulfur and thermal plankton, which helps with muscle pains, blood circulation, digestive and respiratory systems. If that is not enough reason to take a dip in the water, it is also great for the skin. The source of the hot water actually comes from the Monte Amiata volcano, which is 40km away. 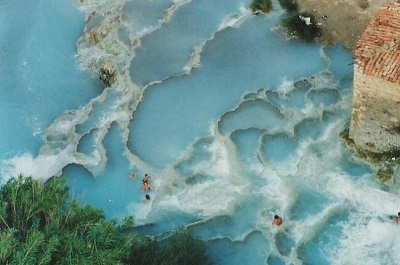 The water comes gushing out at 98.6°F (37°C) near the Terme di Saturnia hotel, which is a luxury spa and golf resort, before spilling out into the Gorello river. Once it hits the Gorello River, it makes it way down to the Cascate del Mulino. By the time it reaches this point the water will have cooled off a few degrees. The Gorello River is free to swim in and a bit more private, but not quite as beautiful as the Cascate del Mulino. This hidden gem has been around for centuries. The Etruscans, which was a civilization that occupied ancient Italy between the 8th and 3rd century BCE, looked at the springs as a gift from the gods. Once the Romans claimed the area, they built the first public bath in history. Many believed that these waters were a gift from Saturn as he used these springs as his own place of refuge. Believe it or not there was a time where locals refused to use the waters fearing it was cursed. During this time they did not see it as a gift instead they saw it as a curse from Saturn who casted a lightning bolt that ripped open the ground causing the hot waters to flow from the gates of hell. As time moved on beliefs soon changed again and people once again returned to these waters. There is a parking lot that offers free parking. Do not park on the road leading to the hot springs because you may be fined. There are no showers or changing rooms, so come dressed ready to swim or get changed in your car. The only restroom on site is located in the cafe and to use it you will need to purchase something. You are swimming on rocks so you may want to wear shoes so you do not cut your feet or slip as you move around. Yes, you can swim at night but there are no lights so come prepared so you can see what you are doing. There is no shade so make sure you use sunscreen and bring an umbrella if you want to take a break from the sun and water. There is sulfur in the water so it will smell like rotten eggs and there is a good chance the water can discolor your bathing suit and jewelry. All photos copyright © Cascate del Mulino a Saturnia. Used by permission. All rights reserved.